If you fancy having the entire constellation on your wrist, this Rendez-Vous delivers an irresistible feminine expression of it. Dressed up in red with the different constellations enameled on the dial, the pink gold case also matches a bezel set with pink sapphires. The Dentelle watch evokes elegance with its distinctive lacework set with 89 diamonds around the 18k white gold case. 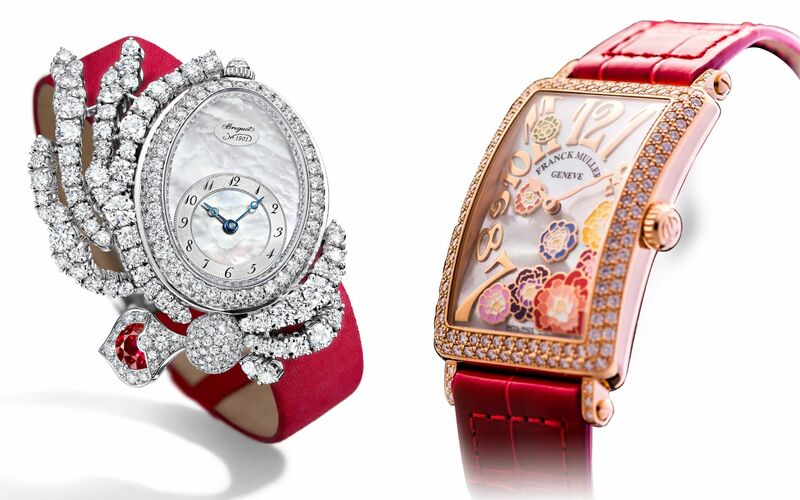 A red ruby weighing about 1.3 carat and a red satin strap add fire to an otherwise icy mien that includes a white mother-of-pearl dial. Known as the flower of riches and honour, the peony comes in a variety of soft pastel colours. Its loveliness – eight of them, in fact - now decorates the svelte rectangular profile of the Long Island with a rose gold case and a diamond-set bezel. The timeless Art Deco shape of the Tank gets an uplift with a pink gold case, diamond-set “bars” on either side of the dial, the 8971 MC movement and, of course, a chic red leather strap. This special edition chronograph celebrates Tag Heuer’s third season as Manchester United’s Official Timekeeper. Naturally, the club’s colour stands out from the logo positioned prominently at ‘9’ and the flange of the 60-second scale, to the hour, minute and chronograph central seconds hands. Paired with a perforated rubber strap in, what else but, red. The red of the rubber strap decorated with Clous de Paris pattern makes an eye-catching contrast against the shiny black of the carbon composite case, a material that makes the watch extremely light despite its large 47mm diameter. Red also appears on the central seconds hand and chronograph counters’ hands as well as the “Superlight Carbon” print.